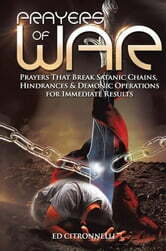 The Holy Spirit has moved my spirit to write this book on warfare prayers. These prayers dal with overthrowing the powers of demon spirits, both principalities and powers and even Lucifer himself. They're effective against breaking curses and satanic manipulation over your life, house, marriage, children, finances, ministry, church, business, health and they stop demons from hindering and blocking your future. They are effective also inde aling with getting the dark areas out of your life so that you will be used of god and fulfill your predestinated purpose.